Sometimes, recruiting the athlete does pay off. For Luke Fisher, the journey from New Jersey prep quarterback to becoming East Carolina’s best-ever pass-catching tight end was a lesson in trial and error. For ECU fans, his successes on the field became the benchmark by which each subsequent tight end has been measured — and, to some extent, the yardstick by which each subsequent edition of the Pirate offense has been judged. 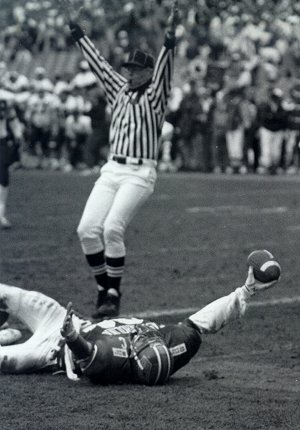 The image of Fisher spread-eagled on his back in the end zone in Atlanta's Fulton County Stadium after scoring the game-winning touchdown to win the 1991 Peach Bowl speaks volumes for the type of player he was and what his accomplishments meant to the Pirates' football program. But it almost never happened, really, had it not been for some hit and miss attempts by a couple of different coaching staffs. Fisher, a quarterback and linebacker in high school in Medford, NJ, was recruited mainly as an athlete out of college. A Northerner, for sure, Fisher had started down the recruiting road with Rutgers and Temple when East Carolina came up from the South and tempted him with a visit. Though his first impressions sold him on ECU, he wasn’t without a small bit of hesitation. Hooked on the Pirate program, Fisher headed South, looking to find his way into the lineup. To play college football, was, in itself, enough to keep him working hard and he realized what it would take to earn his new teammates’ trust. Fisher was committed to finding a way onto the field and nothing was going to derail him. Not a girl from back home, not school, not anything. But, it didn’t start out that promising. Art Baker had recruited the New Jersey quarterback, but really had no real intention of playing him under center. As it was, Fisher was quickly moved to linebacker, a position he played as a prepster. Fisher was impressive at linebacker, but even that did not end up being the right fit. Just before his sophomore season, he was called into new coach Bill Lewis’ office. The move was prompted by the lack of output from the position in the pass receiving phase of the game. While many players would see this as a signal that they were being buried on the depth chart and marginalized out of contention for playing time, Fisher sensed a wholesale change with the coming in of Lewis and his staff. He was mentally prepared for the change and capitalized on it. 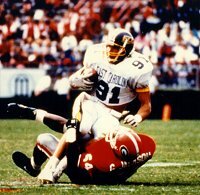 In doing so, Fisher became one of the best tight ends to play at ECU and, perhaps, the greatest pass-catching tight end to ever don the purple and gold. He emerged as an impact player almost immediately. His moments were many and the nation also took note. ESPN even broke into its coverage of a Miami game to show footage of Fisher pulling away from FSU defenders – that’s Florida State – en route to the 91-yarder. More importantly, the ECU-faithful recognized that they had a special player in their midst. And, Fisher is quick to point out, he was just one of a group of special Pirates. Getting only two years at tight end would make most guys think about what could have been had he played all four years in the position. But, it never weighed on Fisher. The reason, it would seem, was the 1991 team. That team reset the standard at ECU and has created an atmosphere of high expectations and a demanding measurement to live up to them. It was also the year that the college world was introduced to Logan’s offense in its purest, most perfect form. History obviously bore out that that team and that offense clicked in a way that no other Pirate team has clicked before. 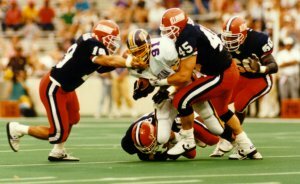 And while the ECU faithful was holding its breath in collective hope after the notorious “Illegal Celebration” – aka, the Illinois Rule – cost the Pirates the 1991 opener 38-31, the players and coaches already sensed what was ahead for the team. And on the offensive side of the ball, the core of talented skill players – Fisher, Jeff Blake, Dion Johnson, Cedric VanBuren, Clayton Driver, Hunter Gallimore, et al – were so in sync, they could probably finish each other’s sentences better than a husband for his wife. “A lot of it was Jeff and his confidence,” Fisher said. “When you play together for a few years, you start to think alike and start counting on one another. It was nothing to nod to Jeff on a 3rd-and-6 with five minutes left and know it wasn’t a problem picking up the first. I know other guys thought the same way. There were certain plays that each guy knew was their number and time to step up. While the fans watched the Pirates' subsequent play top that opening performance week after week as they climbed up the national polls, Fisher had his own especially relished games that season. Though the Pirates consistently pull out win after win en route to the Peach Bowl game against North Carolina State, none of it adequately prepared the Pirates for the last 7½ minutes in Fulton County Stadium — in front of the then-biggest-ever crowd in the bowl game’s history. Fisher recalls the last part of the game. It was fitting that Fisher was the guy who ended up laying in the endzone with his arms raised in V, clinching the win over rival State in one of the greatest bowl comebacks in history. He was an athlete who had truly became an incredible tight end. He wanted to make an impact and he left an impression… an enduring one in ECU lore. His successes on the field as a Pirate translated to a shot with the Minnesota Vikings via the NFL draft (14th pick in 8th round; 210th overall). He was cut in camp. And then he made a run of it in the Canadian Football League. But neither could satisfy like college did. The realities of professional football made it all the easier for Fisher to let go of the dream. After the 1991 season, it would be very difficult to recapture the emotions with any other set of players and coaches. Today, the Peach Bowl only comes up once in awhile when he is talking to close friends. He still keeps up with his old teammates, though not as often or as regularly as he might like. And when Fisher reconnects, he remembers what he most misses about the game. His love of competition has carried over to his career today. Fisher is an estimator and sales supervisor for Paul Davis Restoration, a national company based in Florida. “I interact with a lot of homeowners and insurance companies to complete accurate repair estimates and help cut down on fraud,” he said. Fisher found his way into the business after deciding to pack up his football aspirations. A good friend pulled him into the business. He moved to Florida where he met his wife, Heather, through a mutual friend, in one of those “almost never was” stories that actually did happen for the two. His company certainly doesn’t complain as Fisher – who is based out of Florida – is one of the top five producers for the firm out of a 600-plus national sales group. And to link his success to football is not a stretch for Fisher. With the hectic work environment, Fisher got the type of news, recently, that automatically reprioritizes life. Fisher and his wife had their first baby – a boy named Dylan. The event, as is usually the case in life, has been awe-inspiring for Fisher. “It is life changing. I’m stating the obvious,” he said. 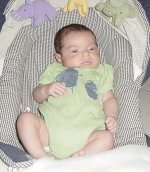 Right now, though, Fisher admits that life is somewhat of a whirlwind, especially with the new baby. But he wouldn’t trade a thing for it. And he does find some time for himself now and then. And now with his new boy around, Fisher hopes to add another traditional trip or two the family tradition list. It would be a chance to show his boy where dad once wowed the crowd as the tight end by which all others have been measured since 1991.